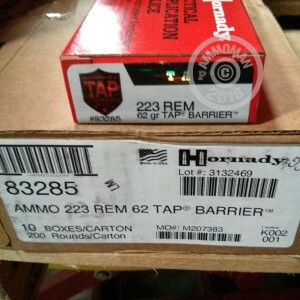 This .223 Remington ammunition from Hornady was originally designed for security forces at nuclear power facilities. These cartridges fire a 62 grain soft point bullet with a thick jacket optimized to deliver strong penetration and expansion. As a low-fragmenting expanding design, TAP ammunition is also suitable for hunting small and midsized game for sport or meat. AmmoMan.com is a great place to stock up on both range and premium defense and hunting ammo. Regardless of what you buy, we provide free shipping for all orders over $99 so you don't have to worry about the details of zip codes and package weights.